Everybody knows where Lucerna Kino is. It is almost as famous as the Charles Bridge. And right on Wenceslas Square in the heart of Prague. It was a fitting place to introduce the concept of Conscious Club, (initiated in Australia by my colleagues Tim Brown and Gary Gorrow). A club is a meeting or group of people with shared interest. Our shared interest was wanting and learning to live more richly, with more awareness, more friendliness, more compassion and more happiness. A little less than a hundred people came and first Cafe Lucerna nourished us with a simple healthy meal. Many were meditator's I had taught over the years of visiting Prague, but there were others who recognised each other from workshops on yoga, dancing, vegetarian cooking, alchemy, buddhist retreats and others. There were familiar faces in the crowd, and some surprises in meeting old friends. The traditional atmosphere of the Cafe made everyone feel secure and laughter burst from the tables over dinner. At 19.00 the call was given to proceed to the cinema, and here the atmosphere of history and tradition quieten everyone as we took our seats, and very comfortable seat at that. It was all new and surprise. No one really knew how the evening would unfold but all there had take the leap into the unknown, taken the chance to support their commitment to a new and better world. This is what Conscious Club is for: to nurture a better more caring, more enlightened society. After the welcome by Tomas Reinbergr (from Vedske Centrum who sponsor CC), Jana Návratová introduced her short film Moving Prague. Filmed in black and white it was rich in the colour and flavours of familiar places around Prague, with dancers expressing the mood of the environment. Everyone I spoke with said how moved and touch they were, all expressing sadness it ended too soon. But even before the credits, the Zabolov Group on stage had begun to add to the sound track. A curious mix of accordion, voice, percussion and electronics Zabelov mesmerized the mind while Marketa Jandová (from the Moving Prague film) captivated the eyes with her spontaneous dance movement to the moods of the music - to the theme of 'Silence is the basis of Activity'. Now I took to the stage, and with Tomas translating, and lead to group into 'Eyes Closed Time- A Shared Experience'. Some people there had their first experience of a meditation experience, and many of us just enjoyed the wonderful dynamics of meditating in a large group. After meditation, I discussed the Vedic World View of Consciousness. When we have shared experience, it is always a deeper experience, whether listening to music, watching a football game, or making love. When we allow the mind to quieten, meditate, in a group we all go deeper. We calm the waves in the collective consciousness allowing the depth of the Ocean of Consciousness to be experienced. Here we experience bliss or joy as our very Nature, the centre of who we are. As we know ourselves as Ocean more and more, the play of the waves on the surface (every day life) does not affect us as much, while we still see the patterns of their play. Afterwards we returned to the cafe for some easy social time with friends and making new ones too. To all who came we would love some feedback on what was good, what you would like in the future, and what you did not like? 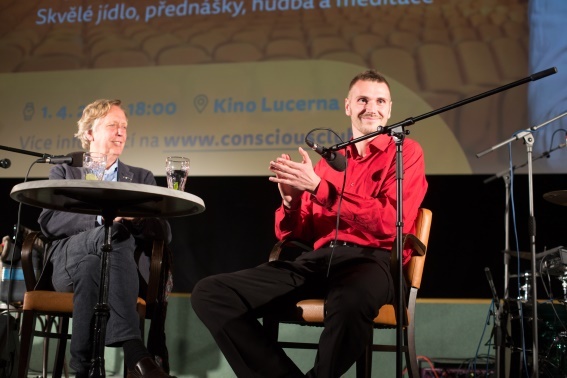 Tomas And I would like to host CC every two months, with new films, music and speakers, together with Meditation, to uplift us and inspire us to lead the good life, sharing Life thru friendliness, compassion and joy.